Scientists thought the Milky Way and Andromeda galaxies were unique: They’ve got rings of smaller dwarf galaxies orbiting in what seems to be a synchronized fashion. But when a team of scientists recently looked at another galaxy, they realized it also seemed to shepherd a flock of dwarfs in a strange, synchronized dance. That’s not supposed to happen. An international team of four researchers noticed the behavior in the elliptical Centaurus A galaxy, 30 million light years away from our own Milky Way. Dwarf galaxies should travel randomly around their parent, based on the standard theory of how galaxies form. Seeing yet another galaxy with this strange behavior is highly unlikely, and calls into question the very model that scientists use to understand structure in our universe. The model physicists use to account for the universe’s behavior since the Big Bang is called the “lambda-CDM” model. It’s basically just a summary of what we know about the universe: It started with a bang, it contains galaxies in a vast cosmic web with voids in between, it has strange substances called dark matter and dark energy, it’s expanding, and that expansion is accelerating. The model predicts that during formation, dwarf galaxies should both appear and move randomly around their host galaxies. Our home galaxy, the Milky Way, and Andromeda have both thrown a wrench in that model, with disks of dwarf galaxies orbiting them sort of like Saturn’s rings. Perhaps these two galaxies were outliers, thought some. Or maybe there’s something strange about our “Local Group” of galaxies, which contains Milky Way and Andromeda. 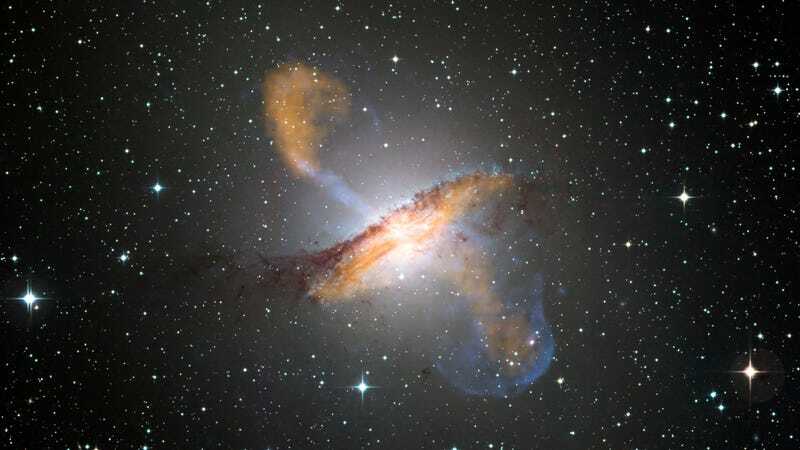 The researchers used data from a survey of galaxies taken by the Parkes Telescope in Australia to look at Centaurus A, which is not a member of the Local Group. 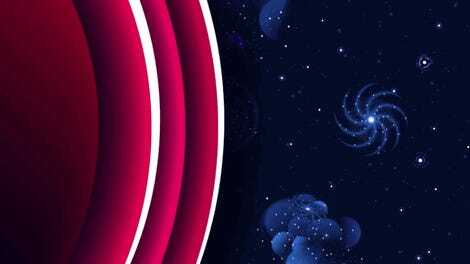 Its disk of dwarf galaxies is oriented to us head-on, so the researchers could use the Doppler effect to see the light from 14 dwarf galaxies stretched on one side of Centaurus and scrunched on the other. In other words, it looked like the dwarf galaxies were moving away from us on one side and towards us on the other, like a spinning disk. The researchers published their story today in the journal Science. Basically, scientists expected that Centaurus A would have randomly assorted dwarf galaxies, but instead, it appeared to have a ring of co-moving galaxies like our own, against the assumptions of the popular standard theory of the universe. The odds are around one in a thousand that a single galaxy would have a disk of coordinated dwarf galaxies like this. The odds that three galaxies would are a whole lot lower—unless our theory of galaxy formation is wrong. The research looked at only 16 of the dwarf galaxies orbiting Centaurus A, 14 of which moved in sync. But there are 44 more dwarf galaxies that weren’t studied, so it’s possible that the researchers were observing a coincidence, and the galaxies are indeed moving randomly and not in a disk formation as they appeared to be, said Müller. His team needs to take a lot more measurements of dwarf galaxies and their velocities around other galaxies in order to strengthen their evidence. Some of the researchers I spoke to thought this research was persuasive. Bridget Falck from the Institute of Theoretical Astrophysics at the University of Oslo in Norway was more cautious. “While the article strengthens the evidence for there being a co-rotating plane of satellites around Centaurus A, it is premature to claim these planes can’t be understood in the context of Lamba CDM cosmology,” she told Gizmodo. She pointed out that the environment around Centaurus A is similar to that around the Local Group—it’s relatively isolated. Most galaxies live in much busier parts of space than our own, she said, and perhaps this has something to do with the behavior. But astronomer Stacy McGaugh from Case Western Reserve University pointed out that lambda-CDM already has problems, and absolutely thought three galaxies with planes like this were a challenge to the paradigm. Lambda-CDM’s math generally works (aside from the fact that no one has discovered dark matter yet), so astronomers treat it as a success and either toss anomalies like this one with Centaurus A under the rug, or as a detail that needs to be worked out later. So perhaps Müller and his team have found yet another statistical outlier, or perhaps isolated galaxies work differently from large groups of galaxies. Or maybe they’ve found yet another problem with the generally accepted theory of cosmology.